In 2014 sidewalk bridges still partially obscure the facade after a two year restoration. By the turn of the last century, apartment living for upper class residents had become acceptable. To distance high-end apartment buildings from tenements, their developers marketed them as French Flats. Well-to-do residents enjoyed spacious apartments on a par with private dwellings as well as luxuries and amenities not found in most houses. Apartment builders vied with one another to lure high class clientele with new technology like telephone service, elevators and electric refrigeration. Nowhere in the city was the trend more evident than the booming Upper West Side. Hamilton M. Weed saw the opportunity in the rapidly-expanding neighborhood and commissioned architects Janes & Leo to design an ambitious project of four row houses along West 105th Street and an adjoining, elegant Parisian apartment building on the corner at No. 925 West End Avenue. The architects’ energetic design of The Alimar exploded in Beaux Arts decoration—the height of fashion of the day. A two-story rusticated limestone base supported four stories of deep red brick, capped by a sloping copper mansard roof. 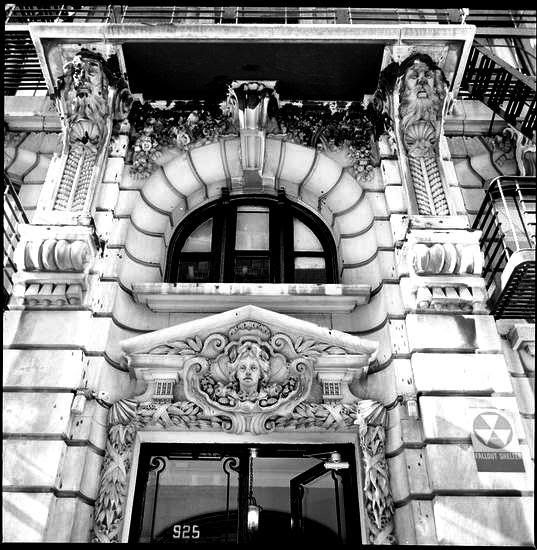 Frothy-topped dormers, oriel windows exuberant carvings created a slice of Paris on West End Avenue. High above the corner, at the base of the mansard, a chubby carved cherub watched the foot traffic below. In March 1899, months before the building’s completion, The Evening Post Record of Real Estate Sales noted that “The Alimar, a seven-story apartment-house” had been sold by Hamilton M. Weed to E. G. Theiry. But the deal apparently fell through and Weed retained possession until March 1900. 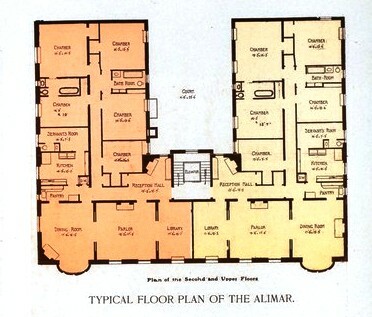 Nevertheless Thiery would live in The Alimar for decades. There were two apartment per floor in The Alimar, each with eleven rooms. Included were a library, parlor, servant’s room connected to the kitchen, and multiple bedrooms. Guests entered into “charming and picturesque reception-room” with a “Colonial” fireplace and seat. The dining rooms, with the oriel windows, were paneled in mahogany, as were the libraries. Throughout the floors were hardwood parquet. The frothy carved limestone continued throughout the upper floors. At the end of November 1899 The Alimar was officially completed. In fewer than three months Weed had rented all but two apartments. 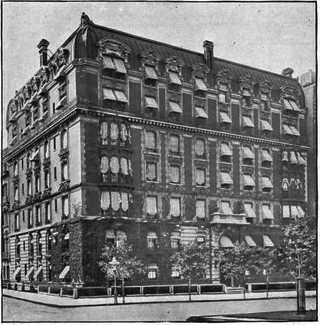 Among the first residents was the building’s designer, architect E. Harris Names. Other respected tenants followed. 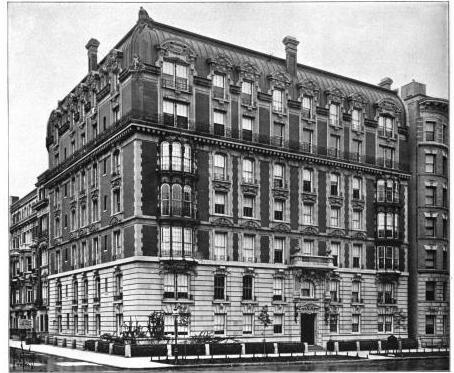 In 1902 Dr. S. Olin Hardy announced through The North American Journal of Homeopathy that he “has removed to ‘The Alimar,’” and a year later William Hill Hunt, President of the International Bank and Trust Company of America was living here. Young Richard S. Hunter lived in The Alimar with his parents when, on January 17, 1908, he took his father’s touring car for a spin with his friend, Leon Sherburne, an electrician. Before long there were three young women in the car with the boys—a situation that possibly contributed to Hunter’s distraction that ended tragically. Back home at The Alimar the Hunters were no doubt traumatized to hear that both their son and Sherburne were arrested, charged with felonious assault. Happier times in the building occurred when Mrs. Le Roy Brewster returned from her tour of Japan in February of 1912. The New York Times society section called the Japanese luncheon and bridge party she hosted “One of the most delightful parties of the week.” Mrs. Brewster greeted her guests in a Japanese robe with obi, and each received a kimono to wear for the afternoon. “Wisteria and cherry blossoms trailed around the walls of the dining room, where the party was held, and over the ceiling to the centre, where American and Japanese flags and a huge paper umbrella covered the chandelier,” said the article. The sumptuous bowed windows steal the show. While Ruby Brewster was serving green tea and sake a domestic scandal was brewing in another apartment. The wealthy John Craig Havemeyer lived here with his wife, the former Adah Bryant, whom The New York Times said “was noted for her beauty.” While outward appearances were blissful, there was trouble in the Havemeyer home. In April 1912 Havemeyer quietly sued his wife for divorce. ”Secrecy surrounded the divorce proceedings from the start,” noted The Times. Then in October of the following year the secret became scandalously public. Havemeyer’s friends, said The Times, “were surprised to learn yesterday that not only had Mr. Havemeyer obtained a divorce from his wife…but that there was to be a wedding sequel to his secret divorce proceedings. “Few, if any of Mr. Havemeyer’s friends knew that any differences had existed between him and his wife,” said the article. Architectural details include fierce, snarling lions within the keystones of the lower openings. On the whole, however, life at The Alimar was refined and proper. Mrs. Charles L. Dwenger, niece of millionaire James E. Nichols was here in 1914 and in 1922 the quiet wedding of Louise Meyer and John Kenneth Porter took place in the apartment of Louise’s parents. But that briefly changed in February 1940. Thirty-nine-year old soprano Nina Tal, who performed as Nina Palini, arrived in New York that January in preparation for a concert tour. With her was her husband, Osip, a former wallpaper manufacturer, and their 8-year old son, Ilja. The family took a furnished apartment in The Alimar. The opera singer’s hopes were dashed when the plans for the concert tour fell through. On the morning of February 28 a maid found her here, hanging from a noose made from four scarves knotted together. Times and neighborhoods change and by January 23, 1943 the spacious flats where society teas and weddings had been held were divided. There were now eight, rather than two, apartments on each floor. Perhaps the Alimar's most notorious resident was Bess Bernard who lived here during the 1940s. The quiet housewife was part of a sensational and nationally-publicized trial in June 1950. On June 14, the St. Petersburg Times said “Two lawyers and a housewife, accused of running a New York and Florida “systematic black market in babies,” went on trial yesterday. The prosecutor alleged that the black market baby-selling ring was so profitable that “Mrs. Bernard had a $50 a week secretary and made weekly trips to Florida.” Witnesses told of selling their newborns. One was a 17-year old girl “who described how in May, 1949, she received $100 for her illegitimate baby,” reported The New York Times. On June 29 Bess Bernard was found guilty of running a “black market” in baby adoption deals. The second half of the 20th century was not kind to the once-grand Alimar. By the mid-70s the mansard roof had been removed, along with much of the decoration. In 1997 the building’s owners commissioned Fernando Didal to renovate the crumbling structure. Didal replaced the mansard level with a vertical façade that, like the limestone base, contrasted nicely with the red brick. A convincing turn-of-the-century façade was fabricated. The completed project dared unknowing passersby to notice the deception—an ingenious and well-done solution. The 1997 upper floor successfully pretended to be designed a century earlier. Although lesser-known than his later Dorilton apartments, Hamilton Weed's Alimar invokes memories of the days when West End Avenue lured moneyed families from the East Side of Manhattan. Odd that the tiny servant's bathrooms seems only to incorporate a sink and toilet. I wonder if there wasn't a more complete central servant's bathroom(s) elsewhere in the building for thorough ablution. A quasi restoration at best with the loss of the mansard roof and a tremendous amount of details, it looks comfortable today but the sumptuousness of the facade is gone. Thank you! I have been anxiously awaiting your commentary on the Alimar, my home from 1974 until 1994. And a great picture of my bay window, the top one on the North side. This was a wonderful building to live in and it's great to know all the history. There was a rumor around the building that Diamond Jim Brady had lived there. I guess it was just a rumor! I looked for Brady's name in my research, but it never appeared. I've been waiting over two years for the construction netting to come down so I could get photos and finally publish this post! We share an apartment! My wife and I currently inhabit 5F, and delight in our window. I too had heard that Diamond Jim had lived in the building, but perhaps that's just John, spreading tales. Just saw your post - Is John still the Super? If so, tell him Tinga says hello! I still have dreams about the apartment, and I miss it a lot. But the view across to the dome of St, John the Divine is gone, I guess, which is a shame. I now live in Virginia, with 3/4 of an acre and so many trees. If I can no longer boast of Riverside Park being my backyard, at least I have my own trees now. This one had it all....the well proportioned ornate decoration, the awnings and vines combination, which is a favorite look of mine, and that crown of a mansard roof. I am glad to see it still standing and having had at least a sympathetic restoration, though the loss of so much of the original façade and especially the mansard roof does make a huge difference in my opinion. Perhaps replacing that wonderful cornice sitting "chubby cherub" would put just a bit more of the icing back on the cake? In response to the poster wondering about the servants half bath facilities, I found an article from the New York Times published in 2008 about the history of Alimar that said a servants bath tub was located in the basement!